St John's (Meads) Bowling Club is a flat green bowling club with six rinks founded in 1936, with a current membership of 71; 33 ladies and 38 men. The club is affiliated to Sussex County Bowls and is an Associate Member of Bowls England. 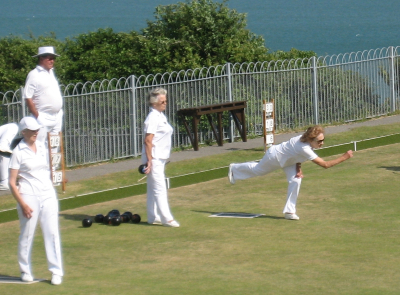 St John's (Meads) Bowling Club is situated in The Helen Garden high on the seafront, two kilometers west of the Eastbourne Pier and just yards from the spectacular chalk cliffs. It is a short distance from the world famous beauty spot, Beachy Head. The glorious views from the green, out across the English Channel, are arguably the best from any bowling green in the UK. If you want "bowls with a view" then St John's is the club for you. Playing mainly mixed matches, we have a comprehensive fixture list against local clubs and entertain touring teams from various parts of the UK. The club runs competitions throughout the summer and bowlers of all levels are encouraged to take part. In addition there are organised or informal roll-ups on most non match days which we regard as an important part of our club activities, helping to maintain the friendly atmosphere for which the club is renowned. If you are looking for a healthy, relaxing or competative form of exercise then look no further, come and join St John's. New members are always welcome, be they experienced bowlers or absolute beginners. Complementary coaching sessions are available to all. For more information contact Dennis our Secretary. St John's is always pleased to welcome touring teams and should you require more information then contact David, our Match Secretary. We only have a small clubhouse which does not support a bar, but fear not the Meads area has two highly recommended public houses just a stone's throw away. The holiday town of Eastbourne is reputed to enjoy more sunshine and dry weather than anywhere else in the UK, thanks to the shelter of the South Downs, the UK's latest National Park. The town is blessed with a range of quality accommodation, from luxury seafront hotels to the humble B&B, almost all of which welcome bowls tours. If you are wanting advice on where to stay we can put you in touch with hotels recommended by previous tourists. Eastbourne has 7 bowling clubs, four of which support two greens, so a tour to Eastbourne need not venture far from base. That said, there are several bowling clubs within 30 minutes drive that are keen to welcome tourists. In the unlikely event of inclement weather, Eastbourne has two two full sized indoor rinks, either of which would welcome a few frustrated bowlers on almost any wet summer afternoon. After bowling Eastbourne offers the perfect place to relax; you can take in a show at one of the town's theatres, enjoy a bandstand concert or just take a stroll on the seafront and pier. The Sovereign Harbour Marina is always worth a visit should you want to dream and pick out your new "Gin Palace" cruiser in time for your lottery win. Alternativly, if your are in the need for a bit of culture there is the Towner Contemporary Art Gallery. And we must not forget the Redoubt Fortress and Military Museum, built on the seafront to keep Napoleon at bay and now housing 200 years of history and the largest millitary collection in the South East.